It wasn't long before my mother's death -- a few months, perhaps -- when, one day, I walked into her family room and she, seated in the recliner as usual, started waving a section of the newspaper at me: "Read this." There was an article about cremains. The gist of it being that there are a lot of cremains around -- and by "around," I don't mean scattered as the deceased may have wished; they're in boxes or bags, sitting on a shelf or in a cupboard, or next to the furnace on the basement floor, because people are "too busy" and don't make it a priority to see that their loved one's last wishes are carried out. Today, it's about how my sisters, daughters, niece, and I made it a priority and gathered at Wild Apple Gallery the day before Mom's memorial in August. We'd always intended to go, along with my mother, to make glass memorials with some of Sharon's ashes. I'd called to inquire about a session shortly after Sharon died but, without any sense of urgency, we never made it a priority to actually get it scheduled. So many bits & bobs and tools and pieces of glass! I don't remember what it's called, but that white piece is fire-proof and prevents the glass from fusing together in that spot. I can insert a small rod or cord through the opening for hanging. Not of all the pieces encapsulated ashes, but many of them did. These are my finished pieces. The sunflower is in remembrance of Mom (it's approx. 4" square, for scale), and the single flower on a blue background is of Sharon, a small bit of their ashes encased in each; the other piece is for both: flowers & blue polka-dot sky! In the tradition of a Sister Weekend, we gathered, we talked, we laughed, we cried, we made a mess, and we created! Together. I knew I wanted to say something at my mother’s memorial celebration on Sunday. I had written, or started to write some things, but didn’t know exactly where I wanted to go or how to pull it together… until the early hours of that day... confirming, once again, that I work best under pressure. I had to talk about the Mystery Shawl KAL and lifted quite a bit of my blog post for that. But I also pulled from another blog post I'd started -- a Ten on Tuesday post about what I'd learned from my mom. It was unfinished, sitting in drafts... I just couldn't do it in May... but it made a pretty good springboard. I wore the amber earrings that Mom brought me from her student trip to Russia in 1974, she's borrowed them on occasion and she was wearing them in a few of the photos we displayed as a slide show. Well, I just wanted to record this as best I could. My mother taught me EVERYTHING, but mostly just how to do the best you can... to be your best, to pull off your best game no matter what. My mother taught me so many things... about how to be strong, independent, and dignified; about how a woman pulls herself up and finds a way to support five kids because it's the only way she's going to survive. I watched as she demonstrated how not to settle for what someone else might think is good enough, finding a way to earn her nursing degree while living on welfare and buying groceries with food stamps. And always with immeasurable style. She had more style in her little finger than all of us put together and it showed in everything – in how she transformed and furnished her home, her yard and gardens, and especially in how she dressed. She could make it work whether it was from Nieman Marcus or Walmart. Mom taught me to knit when I was in 1st grade to reiterate what she learned when our neighbor lady in Highland Park, Mrs. Hamel, taught Mom to knit and Mom taught Mrs. Hamel to sew. I don’t think I actually made anything, but I never completely forgot how to knit, and over the years I’d pick it up now and then – usually when I was lonely – when I moved up north in high school, when I moved to Oregon in the early 80s. The last time I actually spoke with my mother, the Friday before she was transferred to ICU, we talked about my knitting. I’d just begun a “mystery knit-along” with some online friends and had brought it to work on while we visited. I explained how a mystery pattern works (and I’d be happy to explain it to anyone here who might be interested), and talked about how much fun it was to dye yarn again. I had no idea that it would be our last real conversation. I was happy for the distraction that the knitting provided while Mom's condition fluctuated, and eventually declined, over those 19 days. 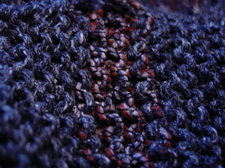 It didn’t faze me a bit – I was even grateful – to tink back and re-knit many rows (14, I think) of Clue 2, stitch by stitch, to correct an error. My knitting was something that I could fix. Probably the most complicated lace pattern I've ever knit, it gave me something to concentrate on and think about that wasn't my mother, though of course I thought about my mother constantly. I looked forward to knitting every night -- after work, after visiting the hospital, no matter how late it was – I had to take time. I enjoyed following along with my friends, reading about others' progress with the pattern, how they felt about their colors, how they were working out the transitions*, concerns over yardage and whether one had enough stitch markers in their possession. I spent time carefully highlighting my pattern clues, color coding the different sections so that it would be easier to keep my place; breaking it down… keeping control. By the end of the month, I was on track and nearing the finish. Therapy knitting at its finest, I was really pretty astounded at my progress and gave a thankful nod to Mom & Sharon, my guardian knitting angels. Though her prowess in knitting never matched that of her sewing, Mom was knowledgeable and appreciative – and I knit many beautiful things for her over the years; my sister Sharon was neither steady nor prolific as a knitter, but she chose the most amazing projects and the quality of her work was incredible. Shawl: 2014 TTL Mystery Shawl – Algiers. This is the part where I had to wing it because I ran out of time… and this is the gist of it, I think. When I actually became a mother, I was stumped! We were between houses in Oregon and lived in a motel for the first week of Katie’s life, and I had to go to a phone booth when I needed to call my mom for advice. She was encouraging, but never had an answer for my questions, telling me that she just couldn’t remember… having five kids in six years, she just did whatever she had to do to get through each day! Mom & Joe came out to Oregon when Katie was 6 weeks old and within minutes I was put at ease. “Oh, you can hold a baby like THAT? ?” And I was immediately reassured and relaxed into motherhood. Our experiences as young mothers and as mothers of teens were quite different, but as the mother of adult children… a friend... I couldn’t have asked for better. We used to do so much together and had so much fun – she set a good example that I try to follow in my relationships with my three daughters. I squeezed about 20 lemons by hand (4 full cups) and grated a half-dozen small beets (1 cup) to make Beet Lemonade! Rusty, Maddy and I each had a little taste, and it declared it DELICIOUS! About mid-morning, I loaded it and a bunch of other stuff into my car and ran off to do the next thing. And everything was great until the jug fell over and dumped the lemonade all over the back seat. I heard it, realized what was happening, and watched it slosh, but there was nothing I could do about it. Ugh. It was a quadruple batch, so that would be about two gallons. There was maybe a quart that didn't spill. The rest was on the floor, soaked into the seat, dripping out of the pocket on the door. Not good. A big mess. I was hurrying = not thinking. I also had to change my clothes about 3 times in the span of :30. There was about an hour where I was coming off the rails! DEEP BREATHS... and ReaLemon to the rescue. I just didn't have it in me to start over with the lemonade. I floated a sliced lemon and some strawberries on top to make it look pretty. meh. It was a beautiful day. No doubt Mom would have made a few tweaks, but I think she'd have approved of our 4th of July decor. I am especially happy about the two small buntings on the window box -- she'd have loved that! PIE!! Apple, Blueberry, and Cherry! Rusty made them on Friday morning; the cherries freshly plucked from Ali & Rod's back yard tree on Thursday. I decided to begin #100happydays on June 1st because I knew that it would be a tough summer. I knew that my mother was failing and that this summer could be her last. I knew that it would be good for me to find some happy everyday. I could not have known that Mom would end up in the hospital on the 4th day. I couldn't have imagined -- sometimes still can't quite believe -- that she died on the 23rd. The 4th of July was one of my mother's favorite holidays. She loved decorating. (Period.) And patriotic decorating was especially fun! We always had a BBQ, and we will this year, too. We'll do our best in the decorating & hospitality department, but no one does it better than Mom. 2. Use all the patriotic tableware! 10. Or, for those of us who don't care to do battle with mosquitoes and/or traffic, A Capitol Fourth and The Boston Pops Fireworks Spectacular! * On Flickr: 1. Ta-da! This is the best of 6, 2. Mom's house, 3. Oh, gorgeous 3rd of June, 4. My garden... , 5. Home, 6. Sunshine makes me happy, 7. Half Way North, 8. Let there be grass, 9. A busy Vicki is... good, 10. So be it, 11. These three, 12. I love making job site deliveries on beautiful summer days, 13. Knitting break, 14. #thiswouldnthappenwithmargarine, 15. Happy 1st Anniversary to Ali & Rod!, 16. Japanese fern, 17. June 17, 2014, 18. Quick lunch & iced tea break, 19. Tough day, 20. Cousins (first, once removed) meet for the first time. WELCOME HOME to my sister & her family!, 21. Helped this gorgeous happy couple & their families by capturing memories of theitlr amazing wedding day, 22. Gonna have to latergram today, 23. June 23, 2014, 24. My sister & her family closed on their new house today, 25. So happy to have these boys back close to home again, 26. 4th of July shopping, 27. I drove straight home from work today, 28. My first week at the Farmers Market, 29. Prepping for the Fourth, 30. Mom. Junebug was part of the airport welcoming committee last Friday. We heard the flight arrive from Atlanta. We watched passengers wait for and claim their luggage. We heard the boarding and departure of the return flight to Atlanta. But we didn't see anyone we knew! Eventually, no one was left in the baggage claim area except for us... and 23 bags circling the carousel! All but one of those bags belonged to my sister and her family and as we unloaded the carousel, they came sauntering down the hallway with a bag of fresh cheese curds. Priorities!! Based on experience over the past almost-week, 5 months old is the very best time to be introduced to your 9yo and almost-7yo cousins! Expressive enough to be interesting, not mobile enough to be a nuisance. The big boys just can't get enough of him! I watched the big boys for a while yesterday afternoon while their parents went shopping for a car. When they returned, I told the boys to tell them what kind of babysitter I was. They said, "The sleeping kind!" Haha. We'd been sitting on the couch and they were showing me their FIFA World Cup sticker books. I learned all about how good/bad each team was, who their best player was, and of course there were some standouts -- the best player of all, the guy who bites, and the guy most recently bitten. Heh. At some point, I'd rubbed my hand over Addy's face and he said that he liked having his face rubbed. "Well, here," I said, fluffing up some pillows, "let's get comfy." Mack got his book and we had some quiet time... and next thing I knew, I heard the boys ushering in a former neighbor lady. I don't think I slept for long, but boy I sure did sleep. Things are getting done. At times, Monday morning seems as though it was months ago already. At other times, the sadness is undeniably fresh. The boys picked a vaseful of flowers from Mom's garden because they knew how much she'd love that. They loved their Nonni so much. The cousins finally had an opportunity to spend some time together and, boy, would Mum have enjoyed that. They stuck like glue! It's going to be so fun to see their friendship develop and grow as they do. So, today is my daughter's 1st wedding anniversary, the day my twin sisters were born, and Fathers Day. A year ago today was one of the best days ever. HAPPY 1st ANNIVERSARY, ALI & ROD!! 54 Years ago today, my mother was in the hospital for a very different -- and much happier -- reason! And, also, SURPRISE! The legend goes (and, yes, it is a legend): Having been told at her OB/GYN visit the day before that she had another month to go, and to expect a big baby boy, she was in the hospital a day later and delivered TWIN GIRLS! The hospital staff awaited placenta after Sharon (aka, Baby A) was born, and lo & behold, a half-hour later it was Karen (aka, Baby B) instead. It boggles the mind -- almost as much as a woman who could look THAT GOOD holding newborn twins. That is my mom. HAPPY BIRTHDAY, SHARON & KAREN!! My mother is still in ICU, tweaking here & adjusting there; it takes time. And patience. And, oh, I just can't thank you all enough for your good wishes. My mom's been in the hospital since a week ago yesterday, in ICU since Saturday afternoon. She's been undergoing treatment for cancer for the past 18 months, and complications from side effects of a new (to her) chemo treatment that was recently begun led to her being admitted with pneumonia. There it is in a nutshell, and it seems that's all I can manage. Please send good juju, mojo, karma, vibes, wishes, love, luck, and prayers. Improvements are slow, and maybe a cosmic boost will help to boot her out of ICU in the next few days. Meanwhile, the little dude in the photo above is Mack and he turned 9 yesterday! Can you believe it? Junah is 5 months old today, and I told him that it won't be long before he's 9... only a few thousand days! I intend to savor every single one, but they sure seem to fly by fast. Thanks in advance for all the love. Back in November, I took Mom to Iris Fine Yarns to see the Habu trunk show. I knew that my mother would like the Habu "style," and I was right. She looked great in everything, and she loved every single piece -- it was just a matter of degree! I tried on a few things, too, and was actually quite surprised at how good they looked! I wasn't expecting that. There's very little shaping in any of the garments, no tailoring to speak of, but the fibers, the finished fabrics, the way the garments are put together, the careful result of what little shaping there is -- I'm not saying they'd look good on everyone, but if there's an opportunity to try on these pieces, do it -- it was a happy surprise. It was a difficult choice, but Mom ordered Kit #68. I'm doing the knitting for her birthday present. It came up on Saturday when we were out together -- and I told her that I hadn't started it yet. Yeah. The tone of her reply -- "You haven't started it yet!?" -- I was practically casting on while taking off my jacket when I got home! The luscious Alchemy Monarch project, which had been coming along swimmingly, has been dropped like a hot potato! I'd just attached the second ball of yarn, too, but it was MOM... the tone, the look, the inflection... oh, how could I be such a terrible, neglectful daughter? Heh. 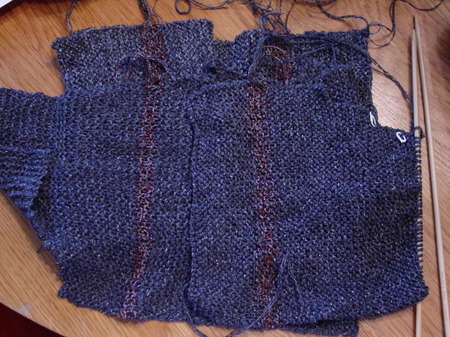 There are eight pieces to knit and I'm at about the half-way mark. It's quick to knit but, man, that chart's a real trip! This project is going to involve more than the normal amount of sewing up, and I'm just going to have to put my head down and blaze through to the finish. 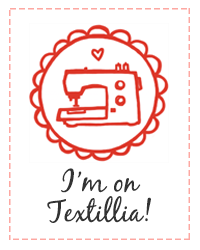 Maybe I'll get on a roll and sew up Oblique at the same time! It could happen. The color differences in Mom's kit are much more subtle than the example on the web (and the one we tried on); the yarns are wonderful to work with.